Select student works are posted each year to Scholarworks, a digital archive for research and scholarly information. CNS strives to be a zero-waste event with a cross-campus Green Event Planning Team that includes members from Auxiliary Services, Physical Plant, and CNS. Eco-Reps are on hand to provide education about sustainable practices and to help those attending put their compostables into the appropriate receptacles. UMass Amherst participates in the Environmental Protection Agency (EPA) Game Day Challenge, a national collegiate competition where colleges and universities implement recycling and compost programs to reduce waste at football games and tailgates. 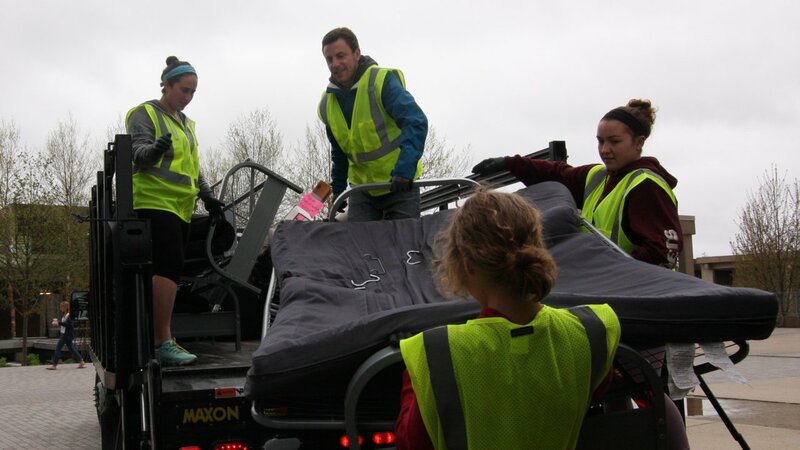 Each year Eco-Reps sort trash taken from campus residential areas to raise awareness about recycling. The New2U program collects unwanted items each spring during move-out and resells these collected items each fall during move-in.